General Douglas MacArthur (Liam Neeson) of the U.S. Army and 8 South Korean troop members led by a South Korean Navy Lieutenant (Lee Jung-Jae) carry out the covert "X-ray" operation. The "X-ray" operation must succeed in order to carry out "Incheon Landing Operation." Filming began December 4, 2015 and finished March 10, 2016. AJ Jun 11 2018 12:12 pm The original film with subtitles, now on Netflix, is of course much better to watch than the version with clumsy dubbing of Korean actors. Fortunately, most of the film is Korean, and they are far superior to the wooden American actors, even Liam Neeson. 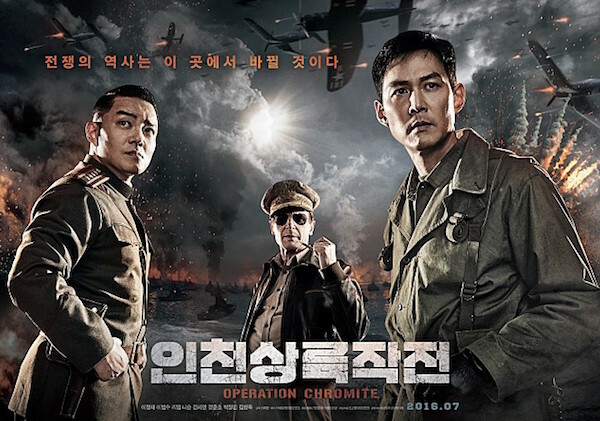 It is a good Korean War film with the amazing true story of the South Koreans’ heroic role in the Battle of Incheon, told through the Korean actors' passion and skill, a story most Americans don't know and should. There is a reason why the Korean actors and their scenes are better than the Americans: Korean film and drama surpassed Hollywood decades ago. Recommended. Sepulchre425 Mar 17 2018 8:21 pm This movie was awesome!! Its actually based off real South Korea soldiers that infiltrated the North during the 1950s Korean War. Im glad there was something like this to at least remember them by. See for yourself and then the research it all comes together. logan5 Mar 04 2018 3:18 pm Like most war movies ... highly inaccurate ... but some good story telling and action. tom Jan 19 2018 6:10 pm How did this mess get a rating of 88? Strictly Hollywood. MacArthur did not come up with the idea of an Inchon landing but did have the chutzpa to pick it up and fight for it after it was presented to him. NK was totally surprised and unprepared for what hit them there. There were ROK spies on the Inchon Islands that scoped out the landing spots, defensive armaments and other necessary intelligence and reported back to ROK headquarters in the south. These guys were never mentioned in the movie. See the post by Jolly Roger for a more truthful account. Most of the movie was about other lead up spy operations that, as far as I could see had little real effect on the outcome. Being there in the fog of war does give less than a complete picture but probably more truthful than the movie. I was in Inchon for the second invasion after NK had run us out again rather than the first one as depicted here, so take that into account. There was just too much shoot-em-up and car chasing going on here to be believable. The bias toward MacArthur is also evident. Macarthur's arrogance knows no bounds as he led us up to the Yalu to be driven back and trapped at Chosin Reservoir in the worse winter on record. Watching Marines whose dead bodies were all twisted in the shapes they froze to death in being loaded on waiting evacuation ships in Hungnam did not endear Macarthur to me so my thoughts are affected by that tragic event that rests in Mcarthur's lap. A further sobering thought is that we have another arrogant leader who advocates using nuclear weapons in the same area. Once out, that genie cannot be put back in the box and the only winner will be the cockroaches. You have to be almost 90 years old to have been there and I wonder how many of "The Chosin Few" hold MacArther in such high regard. He got a hero's parade on coming home when he should have been brought up before a Courts Marshall. wen Jan 22 2017 6:38 am Excellent cast and great story thanks so much more to writer, director and to all of the actors and actresses who are working professional to this great movie and then the cast relationship were like real big family they had great relationship oncam and offcam they respect each other and supporting each other, if they work again in the another project, very likely. Sir Liam Neeson, Lee Jung-Jae, Lee Beom-Soo, Jin Se-Yun and Kim Sun A thanks, you are chosen in this great movie, you all perfect choice , congrats these movie became blockbuster because you all worked with better effort, thanks.. thanks.. beautiful cast..
Ongiya Sep 19 2016 6:16 am Just watching this great movie today in cinema. This movie is inspired by true event, yet it feels so real. In the end of the movie, I saw the real picture of those who died in the real event. All the actors and actress potray the characters really well. I cried several times during the movie because of its greatness conversations and quotes. Thumbs up! Jolly Roger Jun 27 2016 7:36 pm This move is a hatchet-job of Operation Trudy Jackson. US Navy LT Eugene F. Clark led a team of South Koreans on a crucial intel mission, earning a Silver Star for it. Where is he? Nowhere. South Koreans can't let historical reality get in the way of national pride and ego. Hell, why not portray the invasion fleet, air support, and assault troops as South Koreans as well? Why not write out the US Navy invasion fleet and the marines and soldiers of X-Corps who actually made the assault on Inchon as well. If you are going to make a rousing South Korean historical fantasy, might as well go all out. ehii Apr 30 2016 2:46 am Yeay Liam Neeson!! Victoria Apr 17 2016 8:59 am Why it's still don't have release date?? There's no poster or teaser as well. Really can't wait! Doubs43 Mar 24 2016 6:16 pm There was a mission led by US Navy Lt. Eugene Clark, aided by two South Korean Naval Officers and many, many brave South Korean men and women, who scouted North Korean positions, mud flats, tidal patterns, anti-ship mines and much more in the weeks leading up to the invasion at Inchon. The information was crucial to the success of the landings. Clark's base of operation was Yonghung-do island near the mouth of the harbor's entrance. The plot sounds similar to Clark's mission but without knowing more I can't say the movie is based on it or a separate event. Regardless, it should be an excellent movie. Lidi Mar 05 2016 10:47 am WOW! Lee Beom Soo and Liam Neeson though. Can't wait!! Excalibunny Jan 18 2016 8:25 am I doubt this is a love story so don't worry. But WOW.. Liam..
Licorice Jan 12 2016 9:17 am Another historical genre fo Seyeon! Paired with the best actors! But....isn't Jungjae too old for her??? If there is any love story l mean... Anyway, please hurry and release this movie! snowy2 Dec 14 2015 7:44 pm JSY and KSA the two hottest and top actresses of Korea are here very happy this is big production with a best casting. 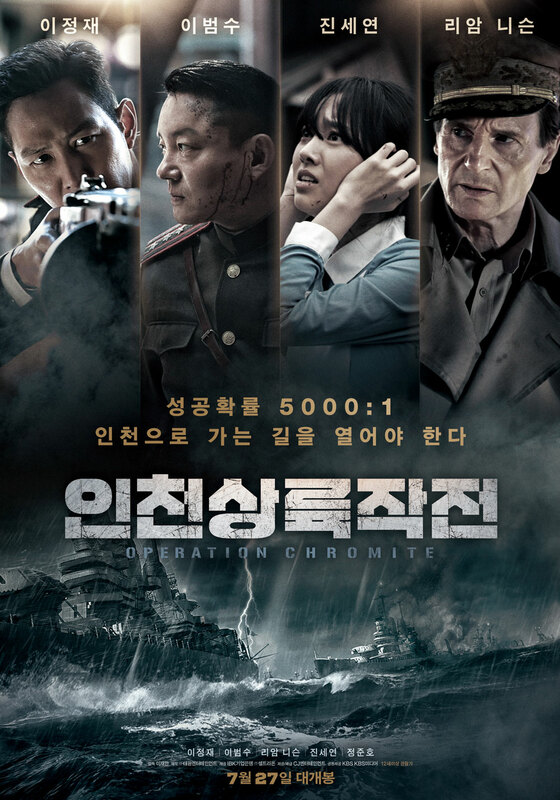 Operation Chromite is anticipate movie of 2016.
tru2u Dec 12 2015 6:39 pm Whoot whoot. they are casting some of Korea's best, and that includes Kim Sun Ah!!!!!! Joo Eun Lee Oct 28 2015 1:41 am I think this is only a movie @Hanee123.. Lol,,anyways i love history movies/dramas..
Hanee123 Oct 21 2015 7:59 am Wow Daebak.. Liam Neeson in Korean Drama can't wait for that..
Jane Oct 19 2015 8:00 pm Great! I really want to watch movie about Korean War...but Liam Neeson as the Douglas MacArthur?! Cool! Can't wait! !